Fisknat Guide Boat Fly Fishing Net With Rubber Bag - BOW: 15"x 23" HANDLE: 31" OVERALL LENGTH: 54". Fisknat has done it again, we have developed another first, in the landing net business. All of our boat nets now come with double reinforced handles, as shown in the picture. 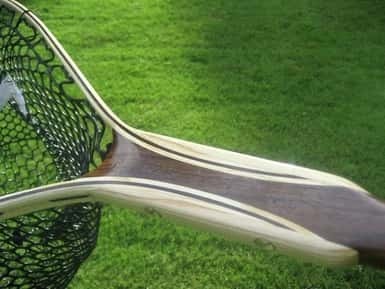 This will be helpful in minimizing the stress that is placed on the wood where bow, meets handle. The trout net that comes standard on this frame is around 15" deep. The Steelhead net is 2' deep. I purchased this net to use on rivers for steelhead and salmon while fly fishing. I had searched for weeks online to find a net that had to meet specific requirements that i needed. The first being that it had to be big enough to net the steelhead and salmon that i am fishing for. When i came across this net, i saw the option for a steelhead netting. The steelhead sized netting coupled with the large net opening is exactly what i wanted/needed. Plenty big enough to net the fish i am after. The second is weight and ability to be carried. I needed a net that was big enough for steelhead but light enough that wouldn't give me back problems while carrying it. This net truly surprised me with how light it is. 90% of the weight is in the netting. I haven't put a fish in the net yet, but when the time comes i am confident that this net will do the job and look great doing it!